PLEASE NOTE: Once your order has been placed, this product is non-returnable. When you place your order you will receive instructions on how to download your software and will then need to verify your eligibility. After your eligibility is processed you will receive an email with a software Activation Key. 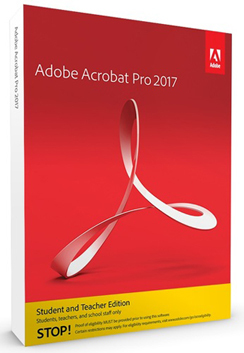 Acrobat Pro 2017 is the latest perpetual desktop version of Acrobat. It simplifies everyday PDF tasks and includes many productivity enhancements when working with PDFs from your desktop. If you know how to print a paper copy of a file, you already know how to create a PDF. With Acrobat, printing to PDF really is that simple. With Acrobat, you can combine multiple files and arrange them in one compact PDF. And present your colleagues with a well-organized collection of project information. When working with sensitive information, it's your job to protect it. With Acrobat, it’s easy to make PDF protection part of your daily routine — no matter what application you’re using. Spend more time on real work, less time on busywork. In the office or on the go, you can save your PDF files as formatted Microsoft Word documents - and start new projects without starting over. Need to make updates to a file, but can’t find the original? In the office or on the go, you can edit paper or PDF documents with Acrobat. It's so easy, you have to try it to believe it. Forget the delays of old-fashioned ink signatures. With Acrobat, you can quickly collect e-signatures that are legally binding in countries around the world. No printing, faxing or overnight delivery required. * 10.11 Support - refer to the Known Issues document for details. Don't settle for confusing notes. Just tap on your notes and your smartpen will play back.